This roomy summer bag made of rough textile is an excellent background for embroidery: intersections of threads are used as canvas here. 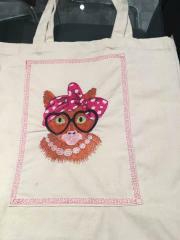 So Cat inside cross stitch free embroidery design looks great on its side: it really seems that fluffy dark kitty is looking from the opened zipper of this bag. 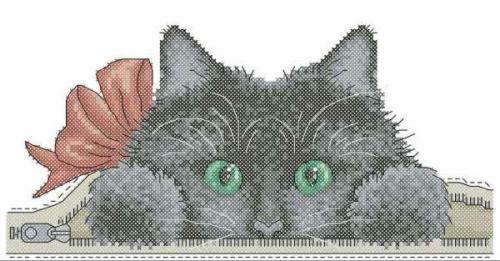 Despite of cross stitch manner of this embroidery sample the cat is very realistic including the bow on its neck. 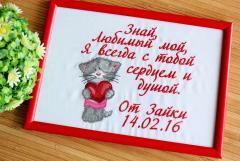 Machine embroidery is a very practical way of transferring an image to a fabric. Thanks to the use of modern equipment and high-quality consumables, the drawing does not lose shape and color during long-term use. 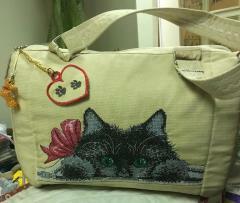 This is an undeniable advantage of products with machine embroidery. 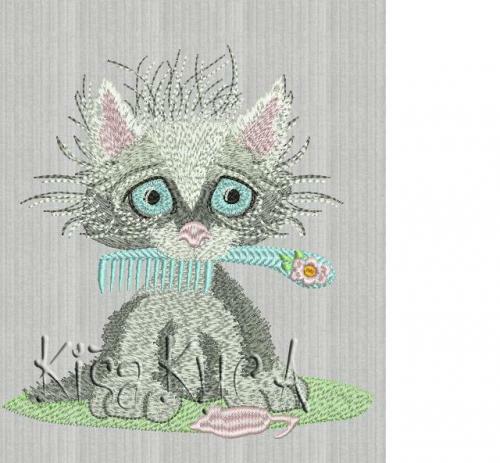 Buy this design here: Kitten Marie machine embroidery design and Tinkerbell machine embroidery design. 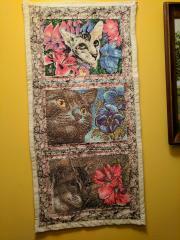 There is the picture showing embroidered collage with three cats. All of them are executed in realistic manner so the portraits of these cats remind good photos. One more common feature of the images is the presence of splendid flowers of different colors on each picture. So these various embroidered samples in one frame look like the one stylish textile accessory. It may me the good decoration for unusual interior. 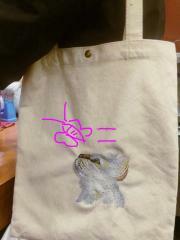 This is the funny photo which shows the nice textile bag executed from natural cotton fabric. 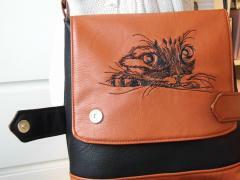 Its main decoration is Curious cat embroidery design. 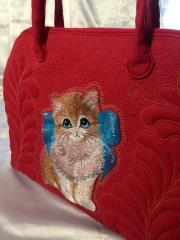 It is executed with the threads of light shades which perfectly combine with the color of the bag’s background. The author of this photo added it by one little funny detail which shows the possible reason of cat’s curiosity. It is the silhouette of small violet butterfly near its face. There is the nice small wallet of funny design which convenient and stylish clasp. 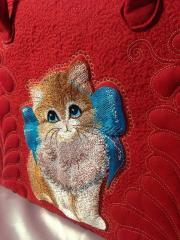 But the real highlight of it is the embroidered picture of cute cartoon cat which is made in accordance with Funny cat free machine embroidery design. 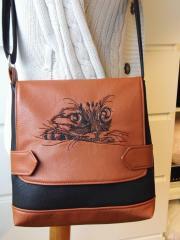 It is the figure of kitty made with thin black contour filled of tightly spaced stitches of white and orange color. 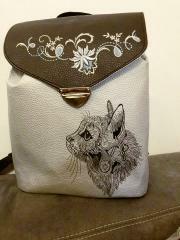 It is not very simple task to make this embroidery on such a small bag but the result definitely deserves it. 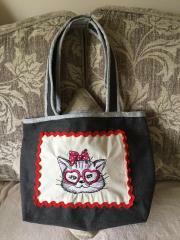 I made this adorable purse for my Granddaughter. She loved the breaking out cat. 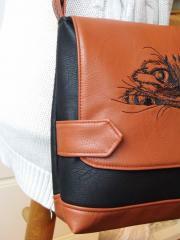 On this picture you may see the final stage of work on unusual textile accessory. It is the work piece which united three portraits of cats in one intricate frame. All images of cats are ready and furthermore they are placed into the frame. The one thing author still needs to do is to finish the work on the border which will be made from cotton fabric of beautiful ivory color.